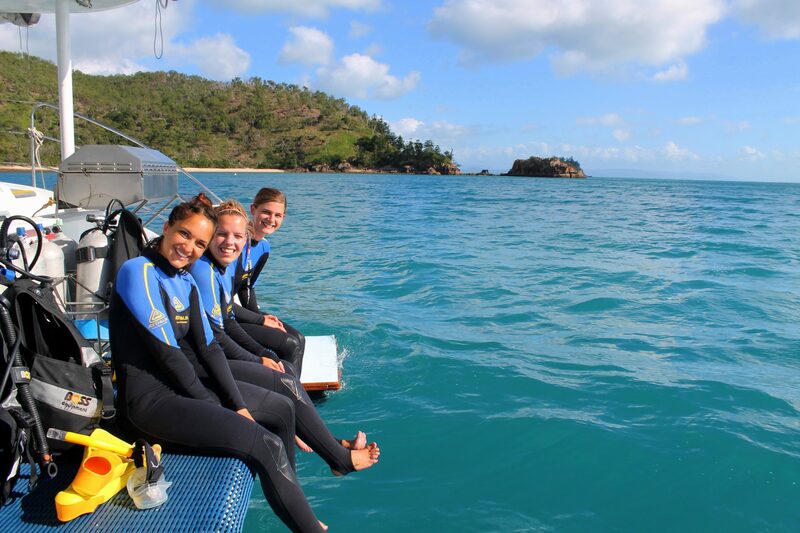 I woke up early the day of my dive trip, after a few relaxing days in beautiful Airlie Beach, I was ready to take on the open sea and find out exactly why the Whitsunday Islands are such a popular travel destination. I spent a good couple of weeks back in Sydney trying to find the right company to go with. 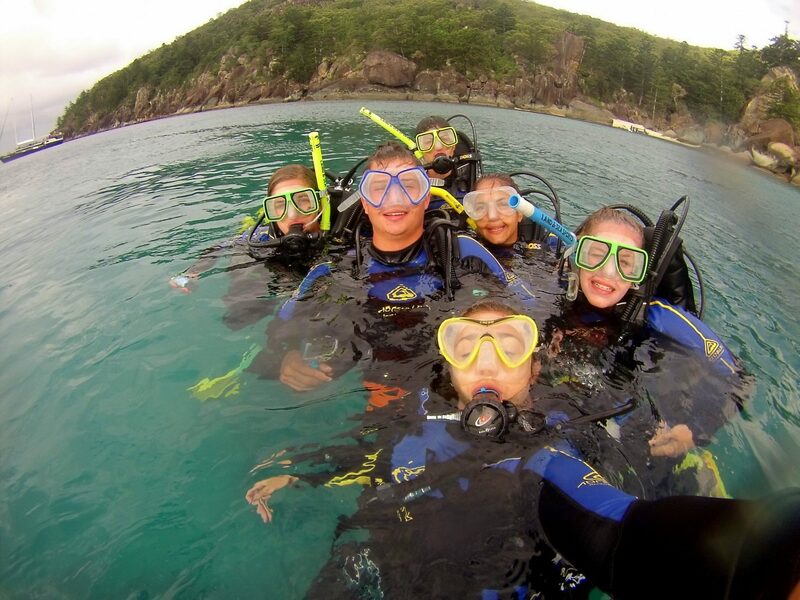 For those wanting to dive in the reef, you have the choice of Cairns vs. Airlie Beach as your port city. I could only afford to do one dive trip, so I wanted to make the right choice. The boats leaving from Cairns will get you right into the reef, whereas the Whitsunday Islands are located on the outer part of the reef. 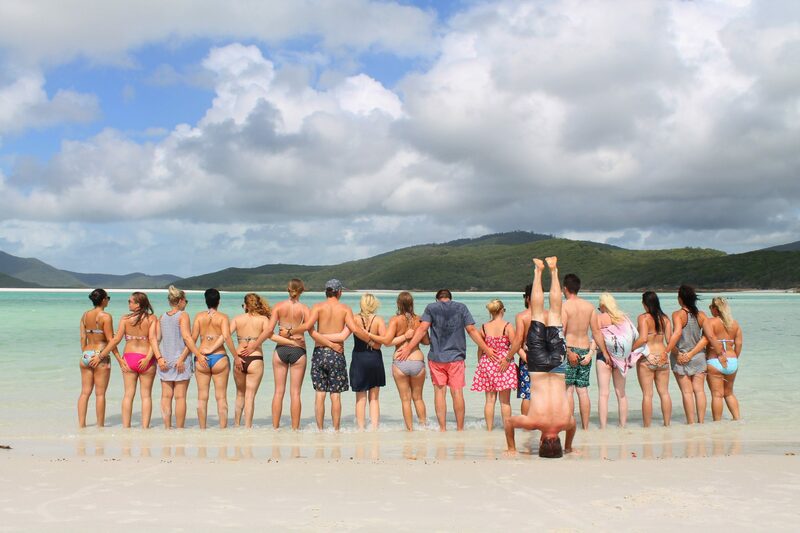 To be honest, the pictures of Whitehaven Beach in the Whitsundays is what sold me, and once I actually saw the beach in person, I knew I had made the right decision. 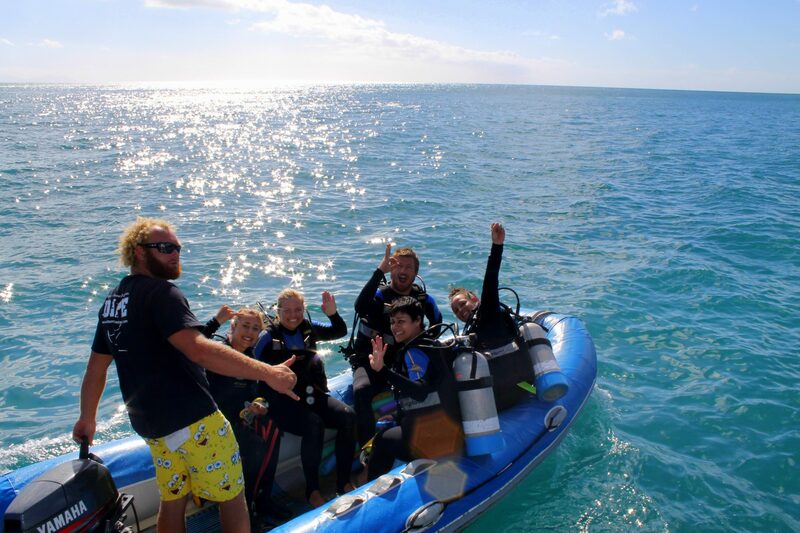 Even with narrowing my choice to the Whitsundays, I had countless dive boats and companies to choose from, and I was overwhelmed to say the least. 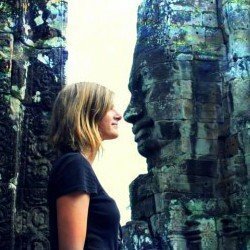 I researched for hours on end until I had one option left that fit into my budget, the dates I would be in Airlie, and the type of experience I would want on the boat. 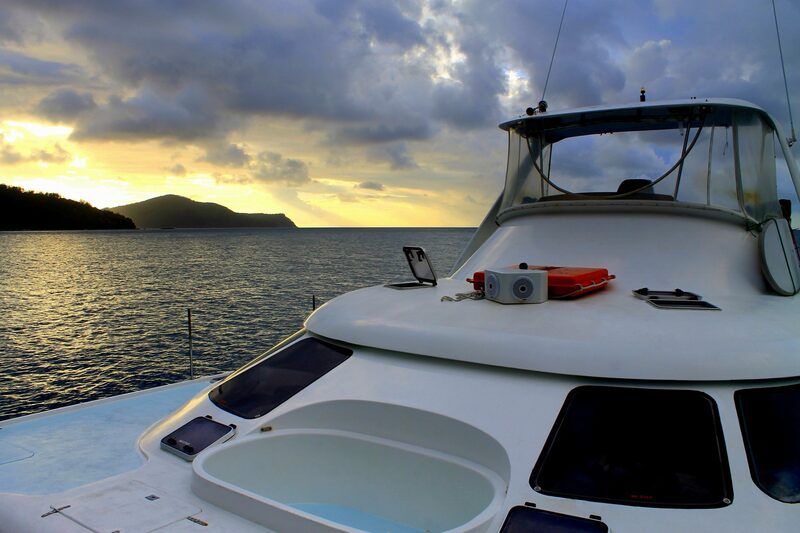 I veered away from the known “party boats”, because I knew I wanted to focus on actually diving the Great Barrier Reef instead of just snorkeling. Drinking and diving do not mix, and most of the huge party boats aren’t equipped for diving for that reason. I wanted a boat that was social, but still manageable in size, and was geared specifically towards multiple dives. 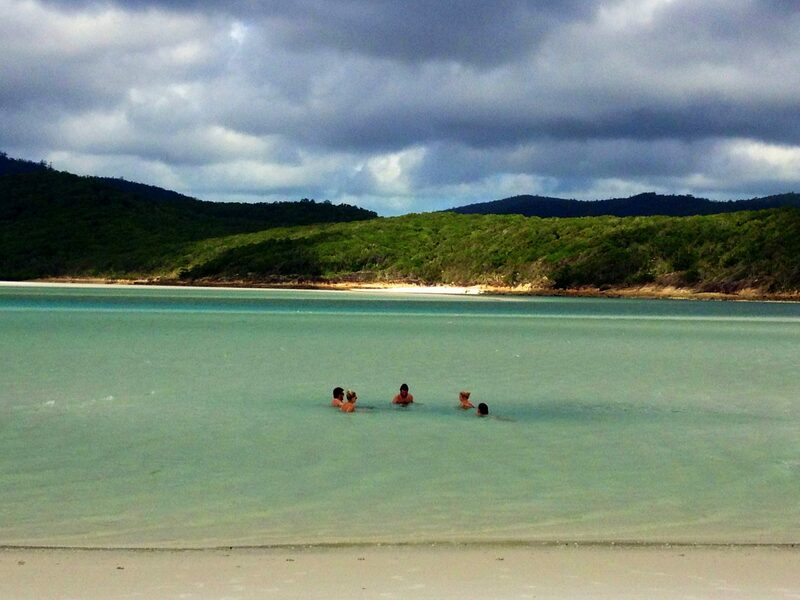 The boat I chose, of course, also had to include a day trip to Whitehaven Beach. 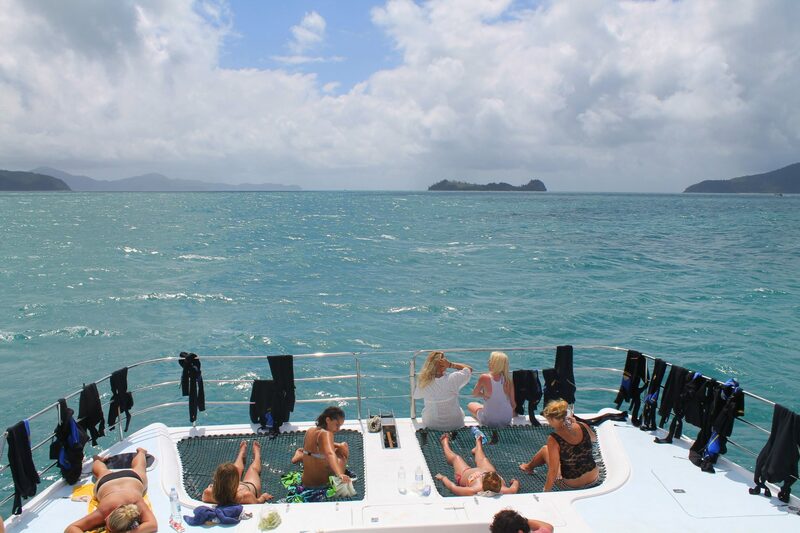 I chose to go with Sailing Whitsunday’s 2 day, 2 night Powerplay boat, which included a variety of options for dives. It cost me AUS$439 not including dives, but that included every meal and a day trip and guided hike on Whitehaven Beach. I did 2 dives that cost me AUS$100 all together, and I bought the USB stick at the end of the trip that had all of the pictures and videos from the last few days, which cost me AUS$3o. The boat had a BYO policy, but each passenger was only allowed the equivalent of 1 case of alcohol each. Most of us brought a sack of goon, the Aussie’s version of disgustingly cheap boxed wine, or in this case, a bag of wine. The goon only cost me around AUS$10 from the local liquor store in Airlie Beach. The passengers gradually started lining up at the docks by mid-afternoon, while the crew started loading our small travel bags and alcohol onto the boat. The lead dive instructor, a Kiwi, came around and took our info and asked if we were certified divers, interested in diving for the first time, or wanting to just snorkel. Out of the passengers on the trip, there was a good mix of nationalities present. I’d say about half were English but that’s not uncommon, especially in Australia. I was the only American, as usual. There was also a Welsh couple, some Scottish girls, a couple of Brazilian women, an Aussie and Kiwi couple, a Canadian, and Carina, a cool Danish girl I especially bonded with because we seemed to be the only solo female travelers on the boat. 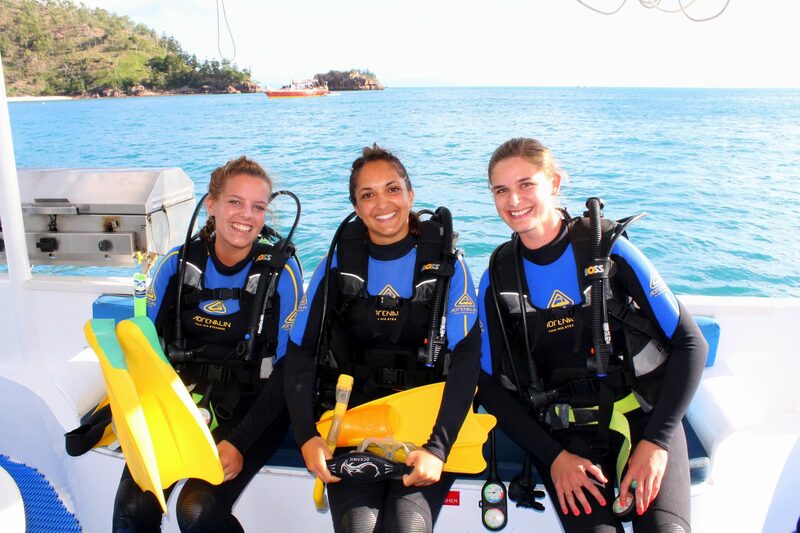 I also made quick friends with Becky and Liz, an English duo on holiday, because we were all dive buddies together. Even still, one aspect I loved about this trip is that everyone seemed to get along, take the time to get to know one another, and become friends throughout the course of a few days, which is unheard of for group trips in my past experiences. Once we were on the boat and given a safety briefing we were introduced to the staff. An Aussie guy from Melbourne as the main cook, a Kiwi girl as our dive instructor, a quiet American guy from Oregon as a dive instructor in training, and another Aussie guy who was fond of wearing SpongeBob SquarePants swim trunks the whole trip as the captain. 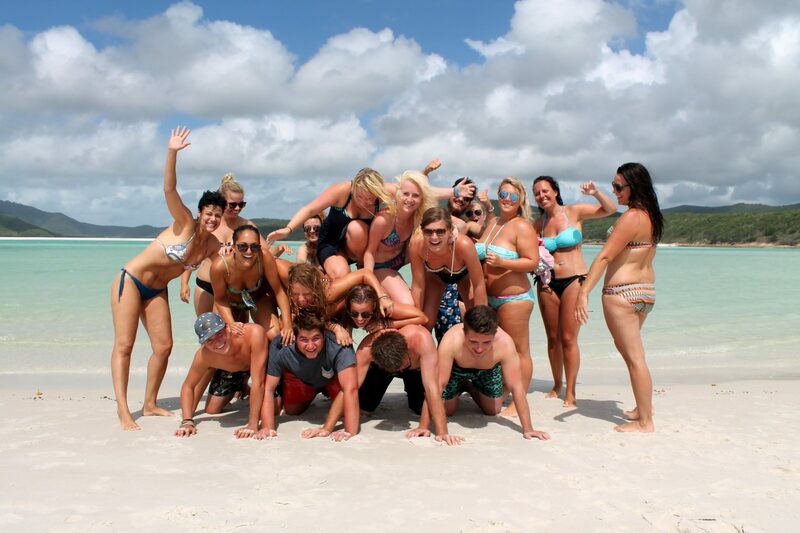 Needless to say, we had a pretty awesome crew. We ate lunch soon after getting settled on the boat, and made our way to the front of the boat to enjoy the perfect blue sky day in the sunshine. The front of the boat had two large nets which most of us laid down inside of, every time we’d hit a bump we’d get soaked, but it was good fun and an easy way to cool off in the heat. Even though I had applied my sunscreen religiously, I would end up getting one of the worst sunburns from those few hours on deck. Even after living in Australia for almost a year, I still clearly wasn’t used to the strength of the sun. In a few hours time of chatting away, reading our books, and laying in the sun, we were approaching our first dive stop, and the divers had to go in the main cabin for the briefing. 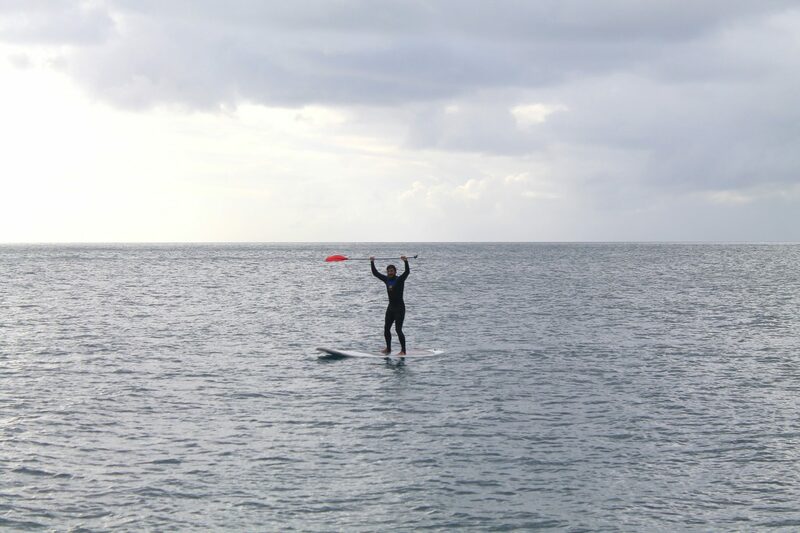 I made my way on the slippery deck, still not quite used to my sea legs, and eventually made it to the cabin where everyone was getting suited up in wetsuits. 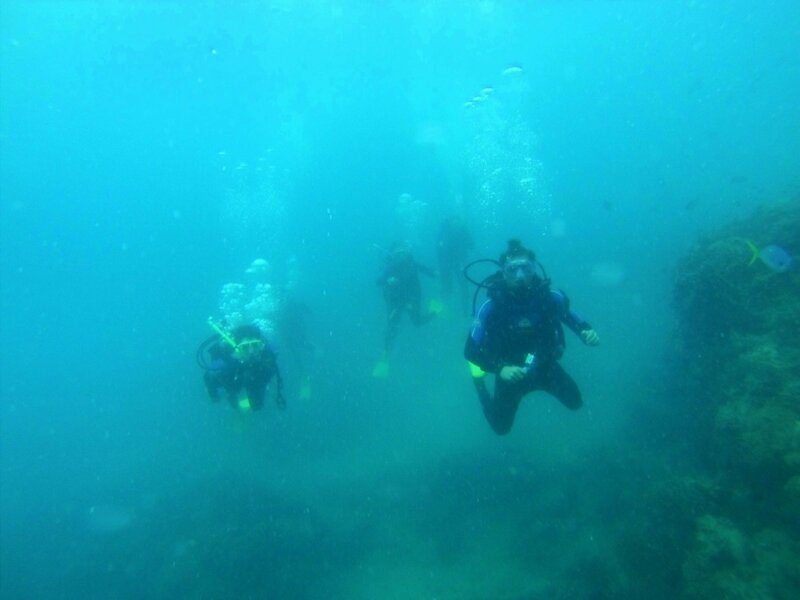 Everyone in my group was certified divers, the instructor would be taking out the beginners and non-certs afterwards for their first entry dive. Even though we were all certified, there was some who hadn’t dived in quite awhile, so the instructor went through the basic hand signals and checks and we were good to go. 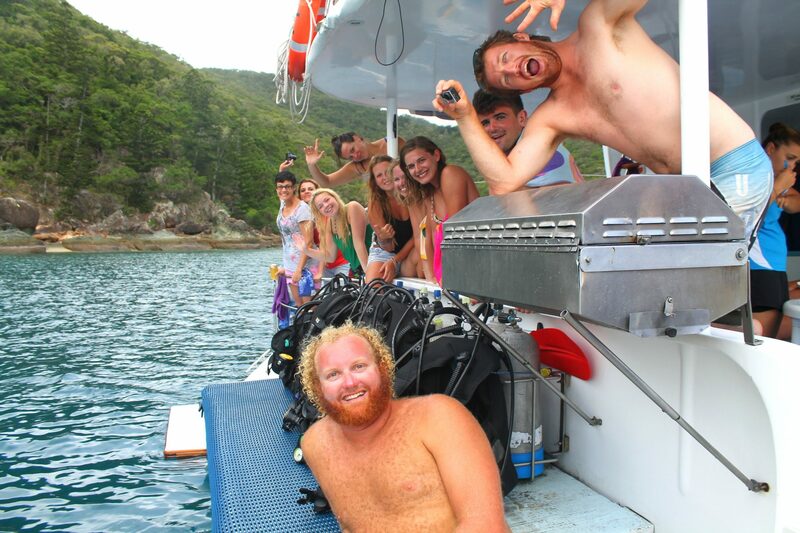 Our dive spot was called Blue Pearl Bay, and we all jumped in the dingy until we found the right area for our dive. It was my first time doing the backwards roll entry and I preferred it so much better than the giant stride entry I had to do while getting my scuba certification in Cambodia. 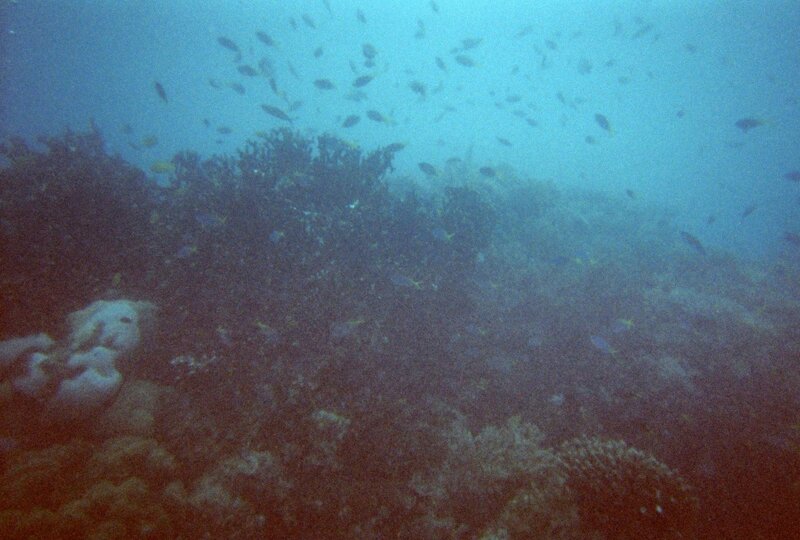 Our dive lasted about 25 minutes and went to the depth of 7 meters (23 feet). When we surfaced again, I was disappointed. The visibility was pretty horrible, and we were only able to see about 2 meters in any one direction. I hardly saw any sea life or vibrant colors as I was expecting. The Great Barrier Reef had built up this ideal for me, and I was worried that I wouldn’t see it in all the glory I imagined it to be. However, I still had another dive, and I was happy I had one dive under my belt to make me comfortable in the water again as it had been about 6 months since my certification. 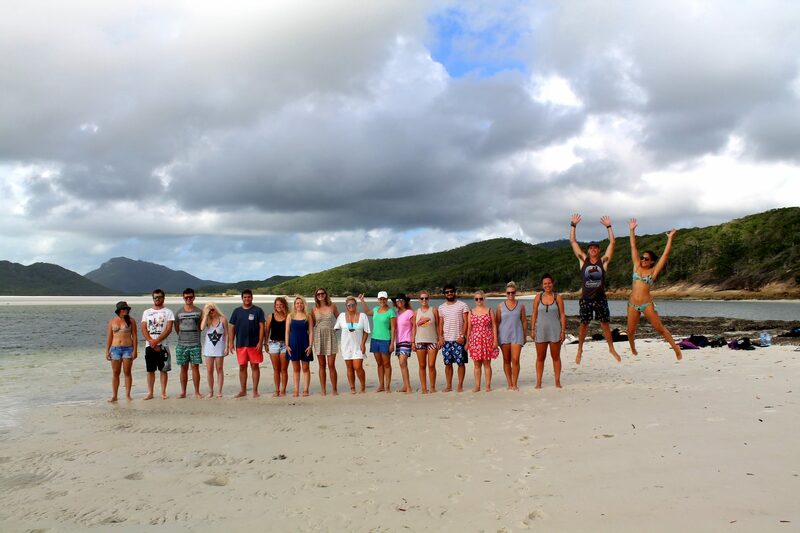 We jumped back on the boat, that would be the only dive of the day and we had a long boat ride ahead of us to get us near Whitehaven Beach for tomorrow morning. The captain, having done so many of these trips, wanted to get us the closest to Whitehaven Beach out of all the other dive boats in the area, because he knew it would be the best possible experience for us if we were first to arrive on the island. 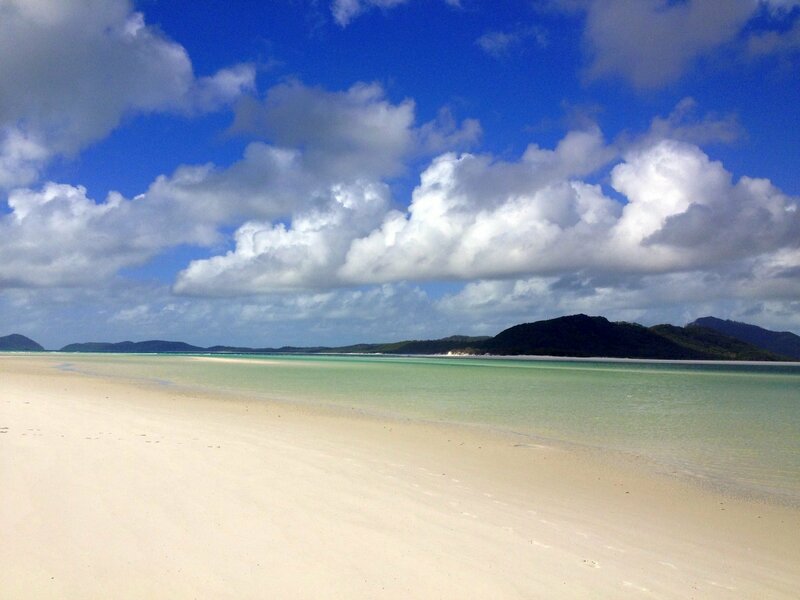 Since overnight stays and campsites are prohibited on the part of Whitehaven Beach we were going to see, it’s a gem when you’re able to be the first ones there, and experience such a magical place that seems untouched by humans and the hoards of tourists that come there throughout the height of the day. We were in motion for most the rest of the night, I didn’t quite realize how big of an area the Whitsunday Islands are spread out over. We all brought out the goon and either started playing drinking games or having conversations in the corner about our day and our individual lives. After 1 cup of goon, I knew it was a mistake to have even touched a drop of alcohol with my proneness for sea sickness, and the fact that it had become a very bumpy ride for the last couple of hours. I decided to take a step back from the festivities, unsure if I would suddenly become sick. The one rule on the boat was that if you’re going to be sick, you can’t go in the bathrooms down below because that will just make you feel worse, you have to spew off the back of the boat. So basically if I did get sick, it would have to be in front of all the friends I had made earlier today. Perfect. I was hoping by getting some fresh air, I would start to feel better, so I made my way to the back of the boat, and leaned myself on an incline, looking up towards the stars. That moment briefly let me forget my sea sickness, I don’t remember ever being able to see the sky so clearly in my life. I could see the whole galaxy, it seemed, and it was the epitome of grandeur and grace. I focused on the stars, and not on my unhappy stomach and it seemed to work for awhile, except for the fact that I kept getting splashed through those damn nets, and it had suddenly become very cold out in the open ocean. The only Kiwi guy on the boat came around and checked on me to make sure I was doing okay. I was fine besides being a bit embarrassed to be the only one very sea sick, but I appreciated that he cared enough to sit with me and look up at the stars for awhile. I eventually made my way back to the main cabin. Unfortunately, since I chose the cheapest “dorm” option for accommodation on the boat, I didn’t have my own cabin, I would be sleeping in the main cabin where everyone was currently drinking and having a good time. I just laid down in the corner and closed my eyes for awhile, feeling bad for having to be so antisocial my first night on the boat. The festivities didn’t last too long as we were going to be early to rise to make it to the island first, and everyone soon went off to their own cabins and slept off the goon. We were woken up early and given a breakfast of fresh fruit and toast. The few of us in the main cabin were up and ready before anyone else and were first out on the dingy to get to the island. We had to jump out when we were close enough to shore and brave the rocks below our feet to make it to the sand. 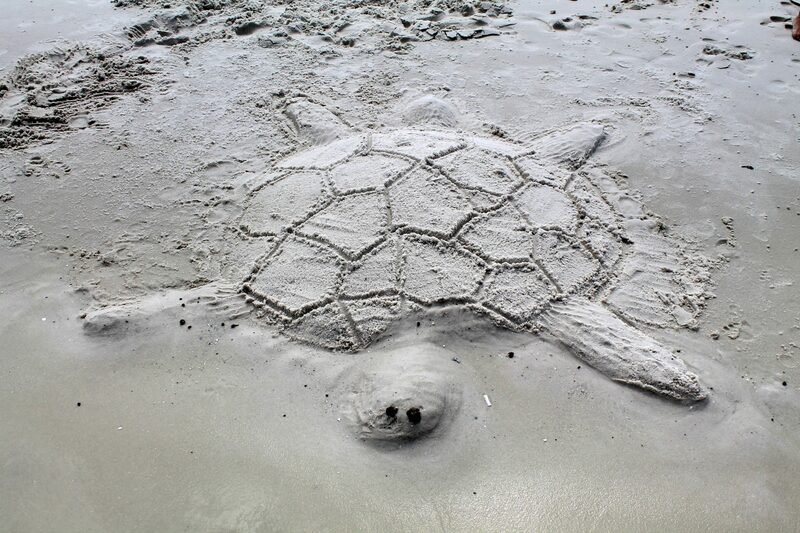 Once on the sand, we waited for the next boatload to get there and explored a bit of our surroundings. 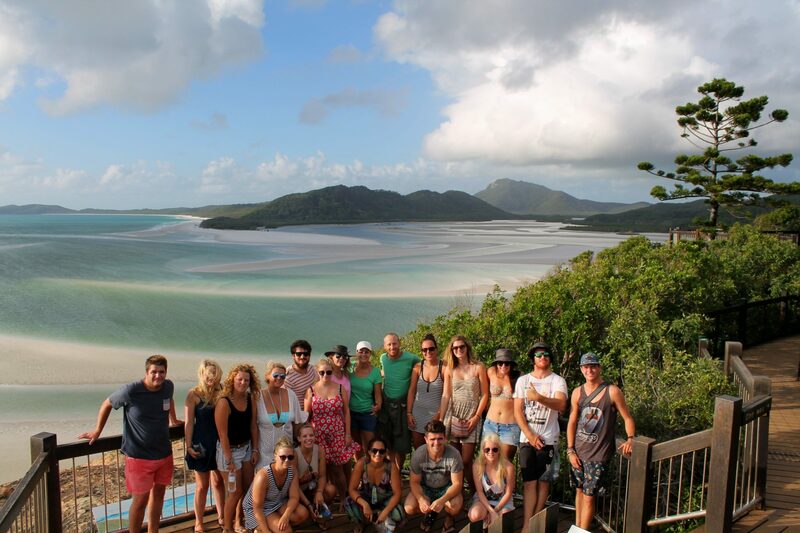 Once we were all accounted for we took off on the Whitehaven Beach Hill inlet trail to get to the famous lookout. It only took about 20 minutes to get to the top. 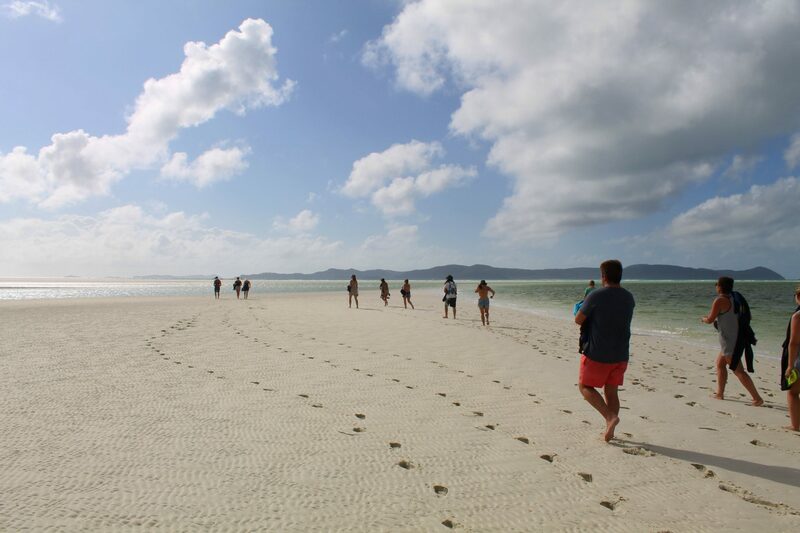 As promised, we were the very first group on the island, so when we looked out over the breathtaking Whitehaven Beach, we saw desolation and raw beauty instead of tour groups and tourists. It was a surreal looking beach, one of those ones you tend to see in the glossy travel magazines or National Geographic, but one which I had never actually seen up close. 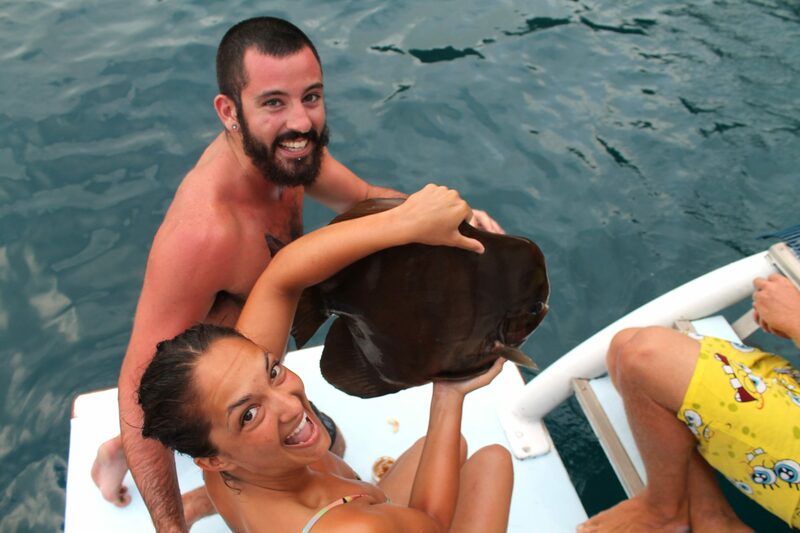 We took a lot of pictures at the lookout, and our guide (read: our awesome Melbourne cook) pointed out the stingrays that were moving fast in the iridescent water below. 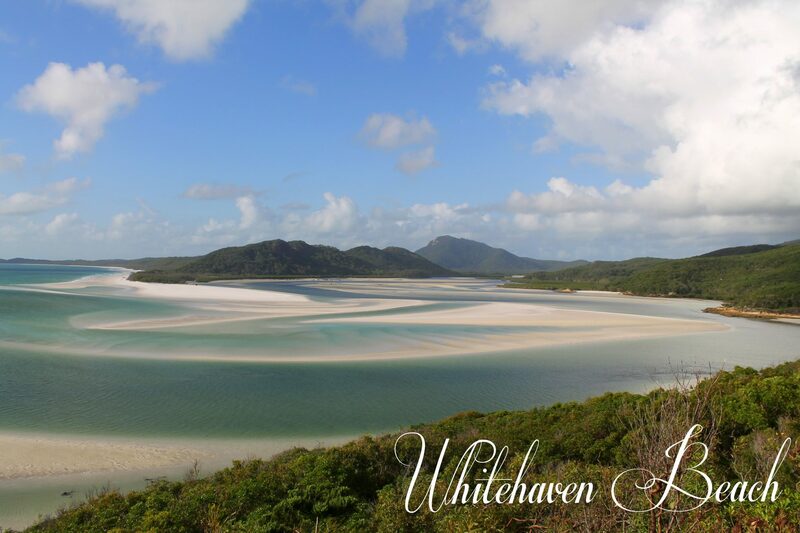 He also mentioned that we would soon be walking through those waters to get to the best part of Whitehaven Beach. We made our way down the trail again, and met the next boatload of tourists and dive boats that had finally landed on the island, 45 minutes after we had it all to ourselves. 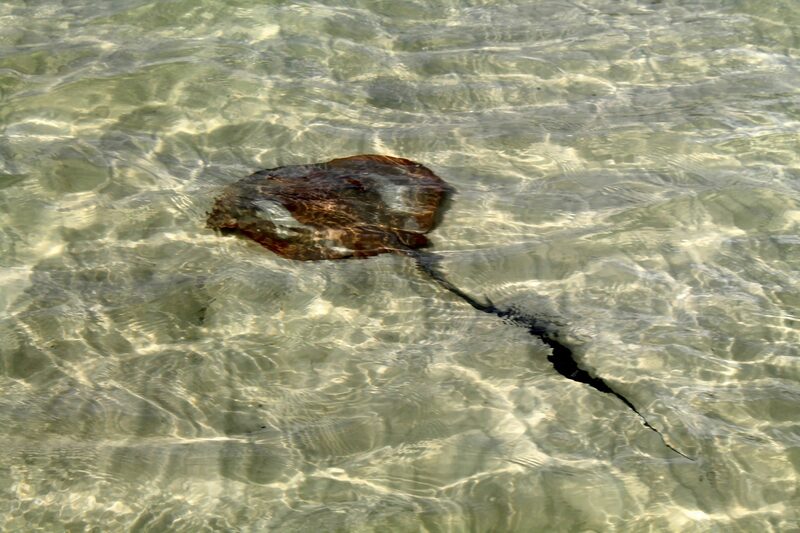 We went and ran down by the beach, and walked through the clear blue water, and did come across more than one stingray. Our guide said that we were perfectly safe as long as the stinger wasn’t raised up. A fact I kept in mind when one of them, moving at lightning bolt pace, came swimming right at us, making some of the group scream and runaway in fright. 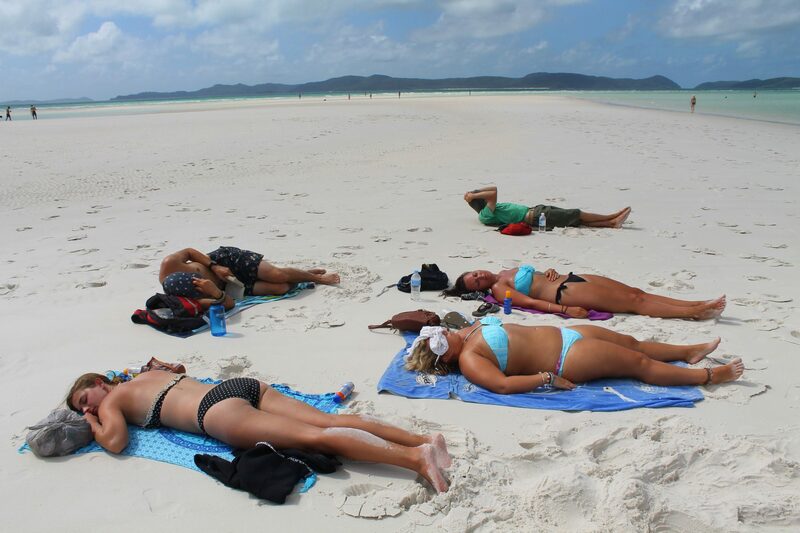 We were completely cut off from the rest of the world, as we were instructed not to take our phones due to the destructive nature of the sand found at Whitehaven Beach. The sand is so soft and fine that if it touches your phone, it will destroy it. 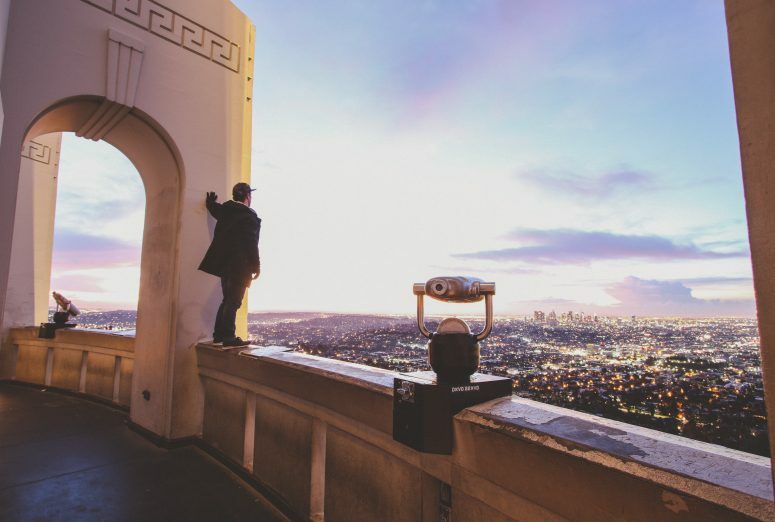 It was a perfect reason to leave technology behind and just enjoy the moment. 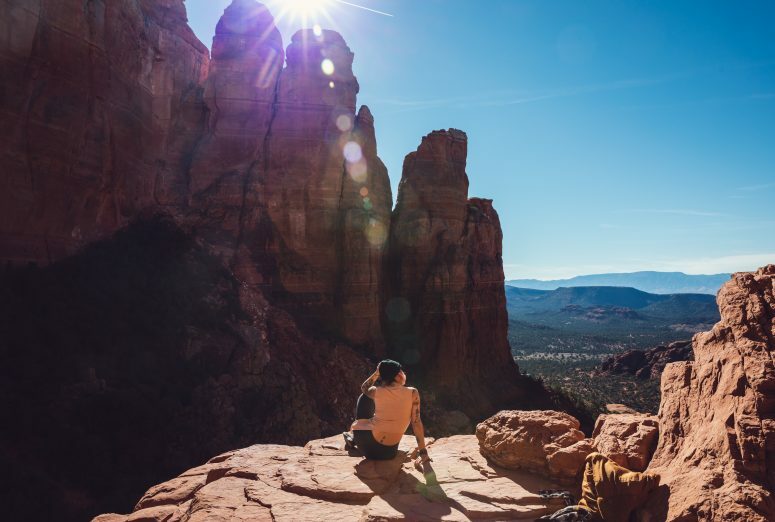 We finally reached a nice spot to enjoy the view and relax. I divided my time between napping, cooling off in the luxurious tropical water, and taking goofy pictures with the rest of the group. 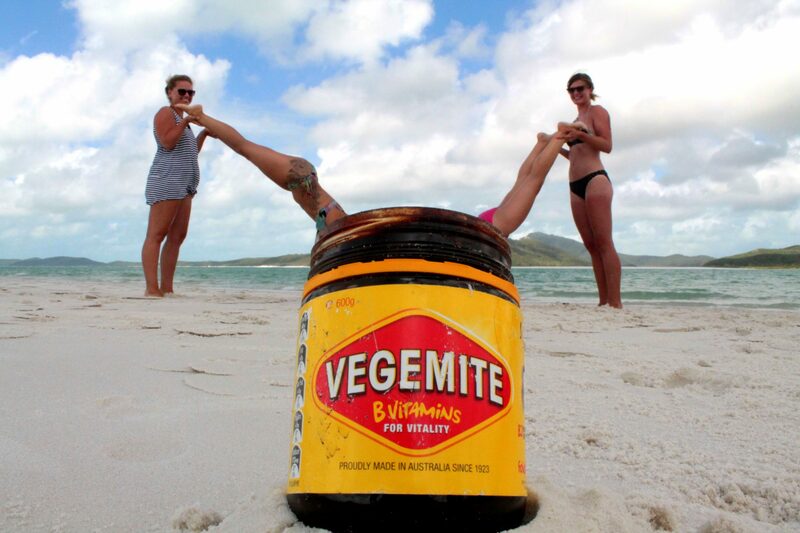 This classy vegemite one I’m particularly proud of. 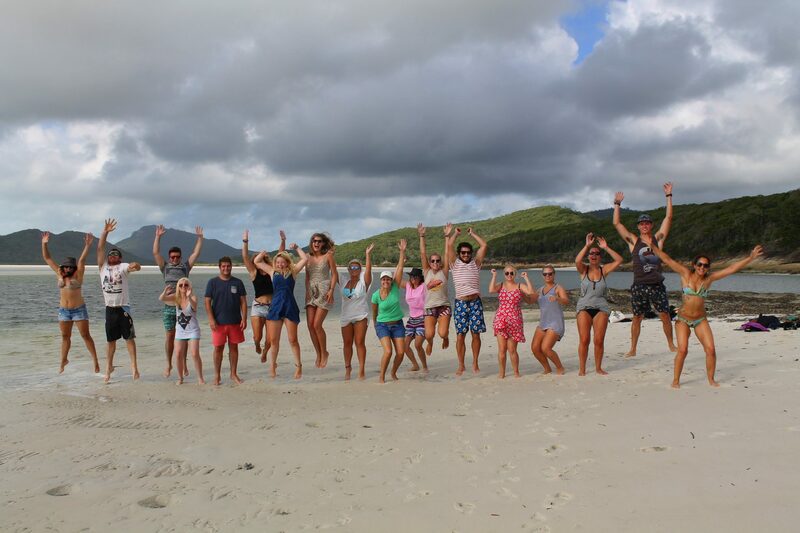 We tried taking a few “jumping pictures on the beach”…. Both of which failed miserably into laughter. And too soon it was time to head back to the initial drop off to be picked up again, we had a long day of diving ahead of us and the day was just beginning. We quickly ate some food when we jumped back on the boat, our next dive site was only an hour or so away, and the divers had to be geared up and ready to go in no time. 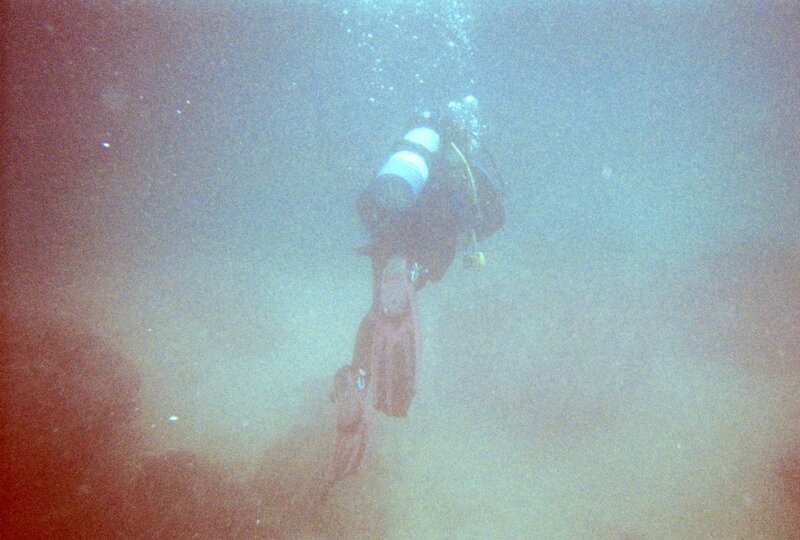 This would be my last dive of the trip, and I had high hopes for this one after a dismal first dive yesterday. 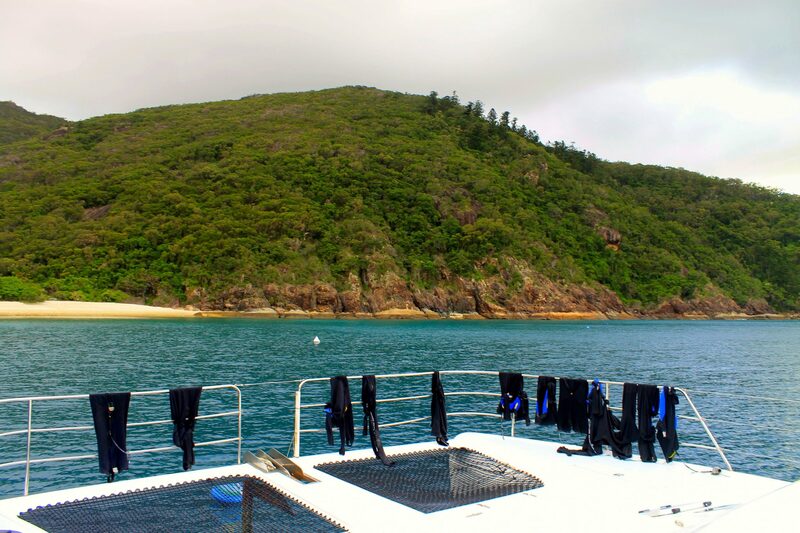 We made our way to our 2nd dive spot, called Luncheon Bay, and entered the water in the same way. This dive was everything I could’ve hoped for, and the complete opposite of yesterday’s dive. 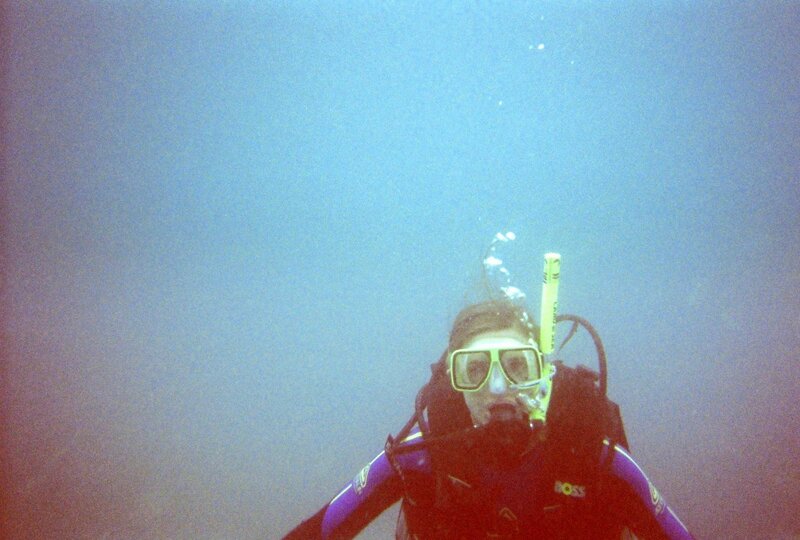 The dive lasted for 30 minutes and we went as far down as 11 meters (36 feet). The visibility still wasn’t perfect, but it was a whole lot better at 6-7 meters in any one direction. This dive had life to it. 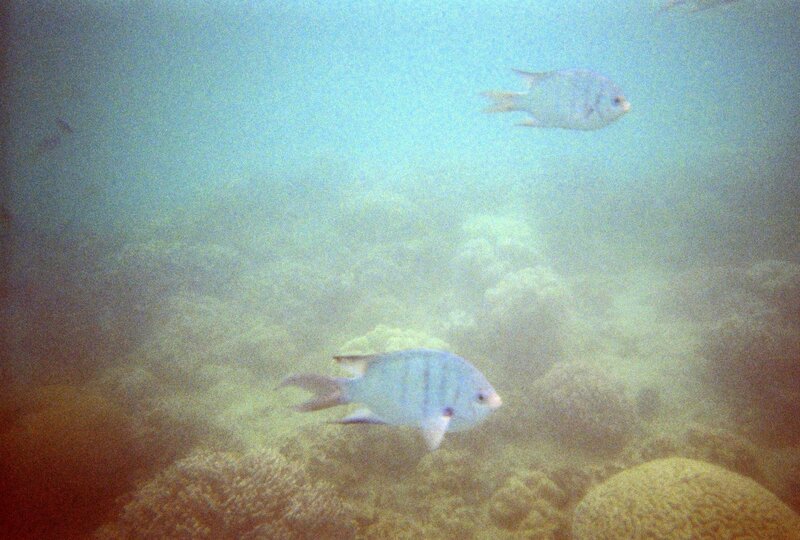 It was colorful and vibrant, there were schools of fish that swam by at any given moment, and a large fish that came up to me, mouth agape and curious. I felt like I was in The Little Mermaid, just waiting for Sebastian to come out at any moment. 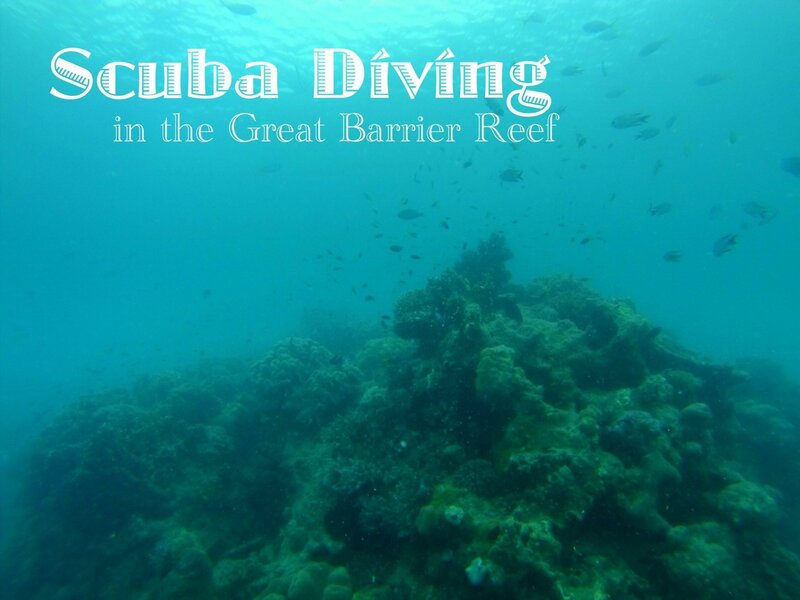 I finally had my quintessential Great Barrier Reef dive, and I couldn’t have been happier. The next dive spot wasn’t far off, and the next round of divers went out in the boat. 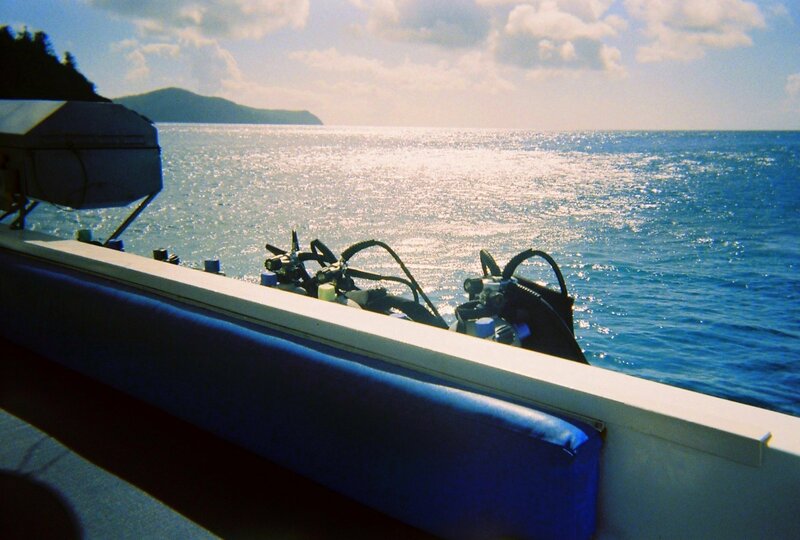 I had already used the extent of my budget, but I was happy enough to have had the experience I had with my last dive. I grabbed a snorkel and jumped off the boat with Liz and Becky, and discovered how close the reef can be from the surface as well. This spot was just as good in terms of visibility and colorfulness, I swam around a different colored reef countless times just trying to take it all in. 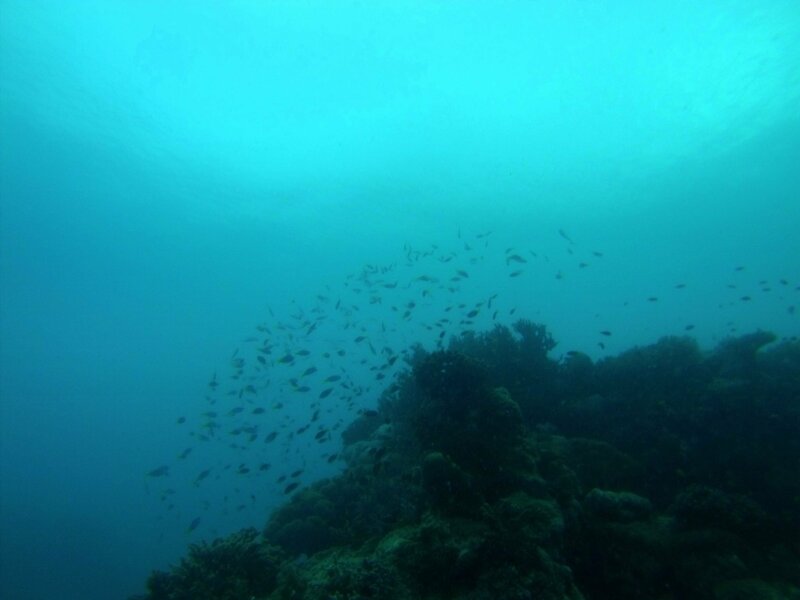 It was great being able to experience the reef from a different perspective at the surface as well as having dived it. 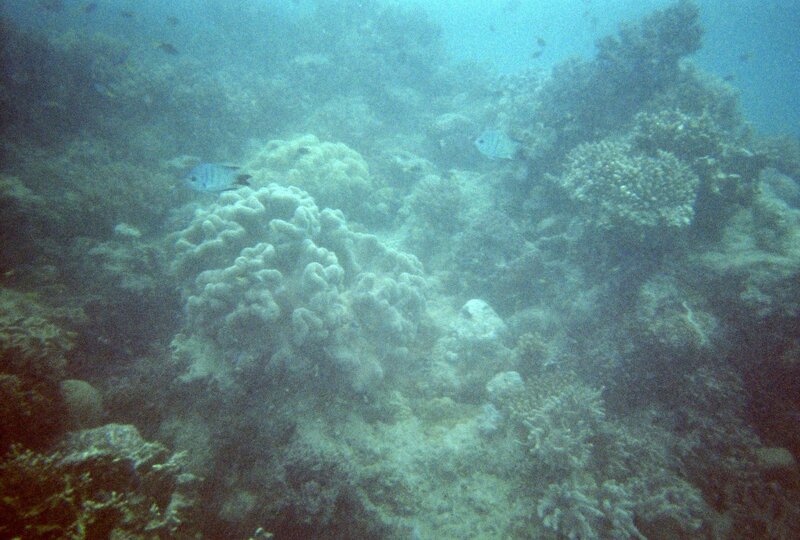 This was the reef I imagined seeing one day, and I couldn’t believe that my lifelong dream of seeing the Great Barrier had finally come true. We finally swam back to the boat, a fellow passenger was trying his luck at stand up paddle boarding and we watched him actually tackle it pretty well. Soon all of us were back on the boat, and drying off in the sun. The sunset that met us while we were eating dinner was gorgeous. There was one more dive that night, the night dive, and few curious souls who had signed up were soon putting on their wetsuits again. I would’ve been right along with them if I had the extra funds. 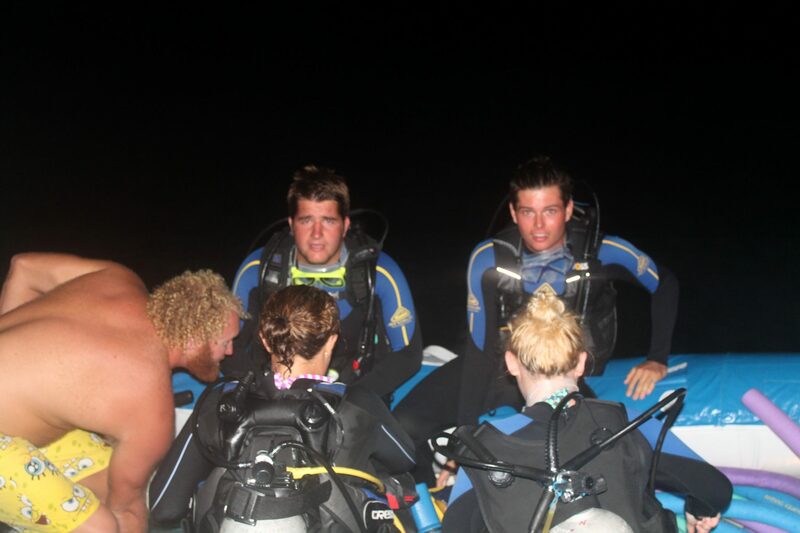 I’ve never been on a night dive, but it sounds like a completely intriguing experience. You only have flashlights and glow sticks attached to your tanks so you don’t lose each other. A few terrified faces looked back at me as they disappeared into the darkness, not knowing what to expect, but everyone came back saying how amazing it was. Shipwrecks and night dives are definitely where I want to progress my diving next. That night there wasn’t much movement from the boat, and I did much better in terms of sea sickness. I think it also helped that I didn’t have any goon and I took my sea sickness medication this time. I played some games with the group, and we watched a slideshow of our trip thus far. 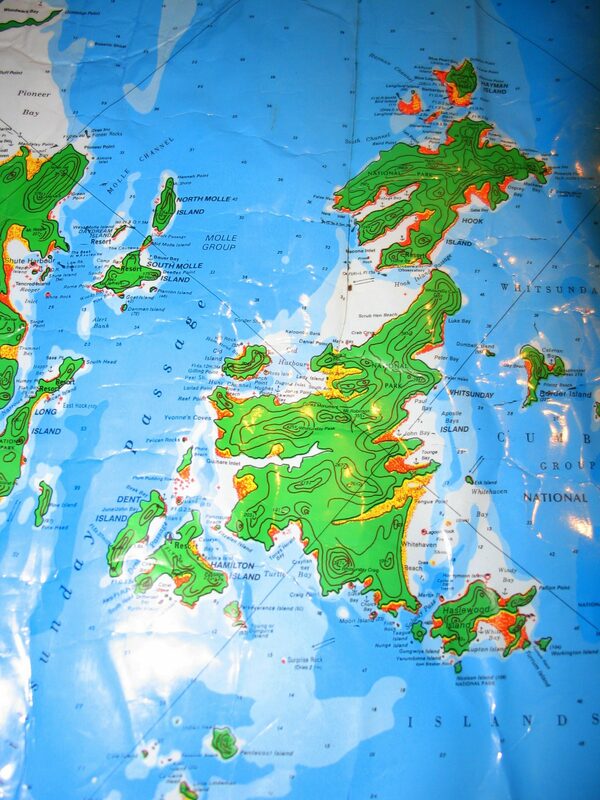 We were even shown a map of where we had been diving so we could orientate ourselves. Later that night, the crew turned on the aft blue lights under the boat, which tend to attract fish and make them come right up to the edge of the boat. We saw so many fish doing just that, one type in particular that had been the one to stare at me curiously in the water earlier that day. The next day, Becky caught the same fish in her hands when it jumped near the boat, they apparently really like peanut butter. I don’t blame them. 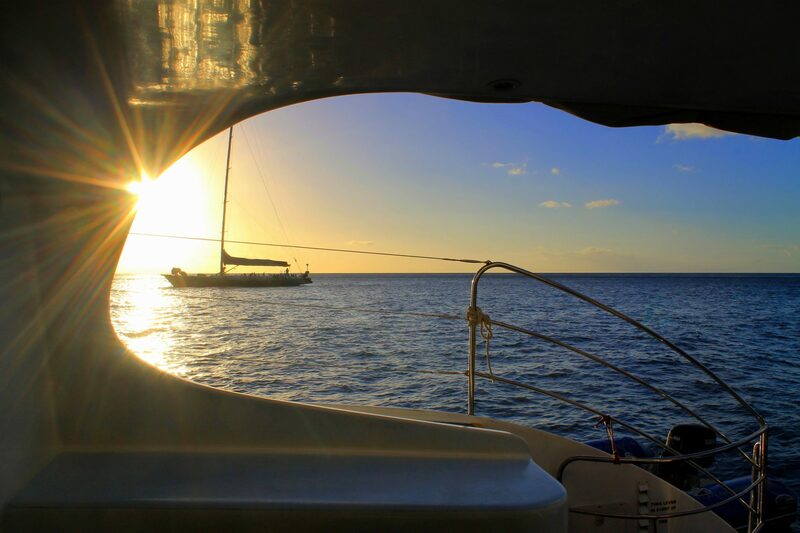 We were able to sleep in a bit longer this morning as today was the last day of the trip, we would just be cruising back to the Airlie Beach harbor. It felt like it had been much longer than two nights at sea, but that’s probably due to the fact that I had never spent that much time on a boat. We all sat out on the deck, watching the ocean pass us by and reminiscing about how great the last couple of days had been, exchanging Facebook info and emails from those who I’d become especially close with. We arrived at the docks by mid-afternoon and said our goodbyes and headed off to our respective accommodations. 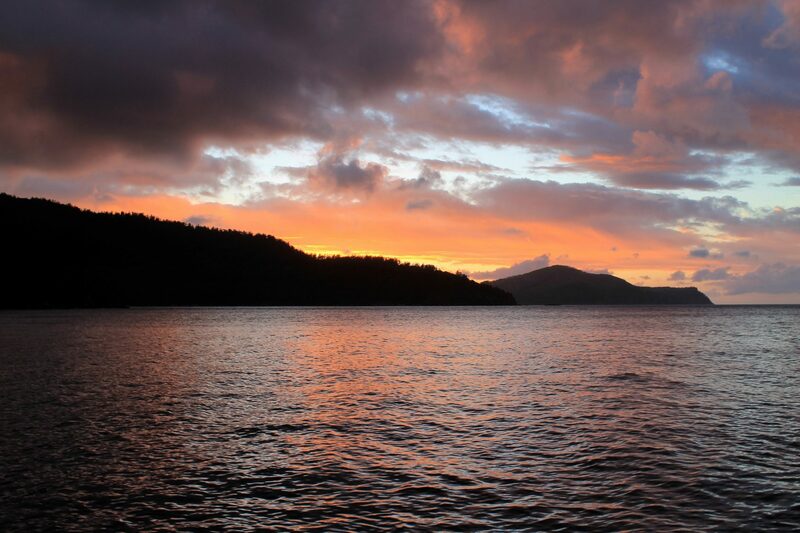 I was taking the overnight bus to Cairns that night, so even though I hadn’t showered in two days, I had to wait a bit longer as I no longer had accommodation in Airlie. 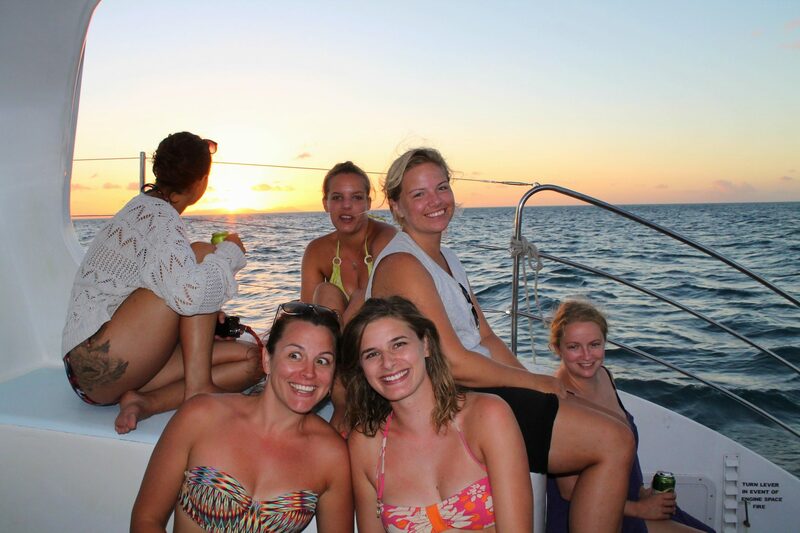 We all met at one of the backpacker bars later that night for drinks and dinner, I had to leave early to catch my bus, but I was so grateful for the friendly faces that had really made my time out on the ocean so special. It was a trip I’m not soon to forget, and one of those travel experiences that didn’t disappoint even with it being so built up in my mind. I truly love those moments. 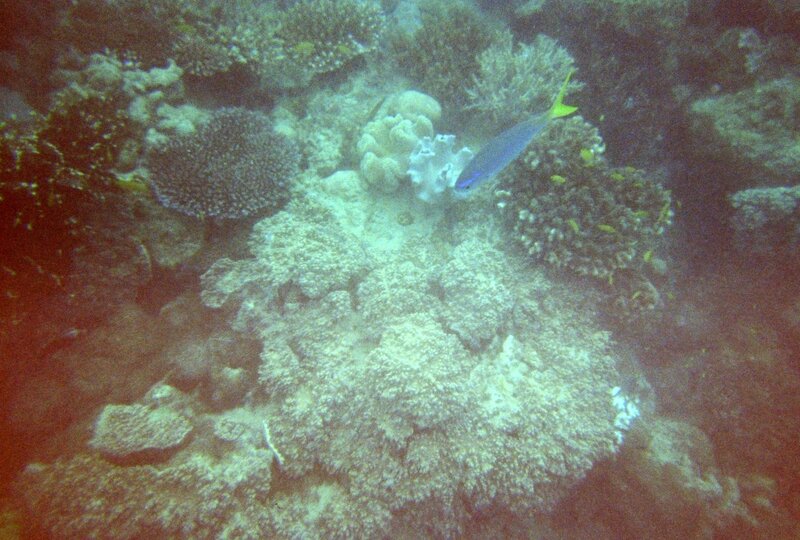 With so much proof of the Great Barrier Reef deteriorating with each passing year, I’m glad I was able to experience it when I did. 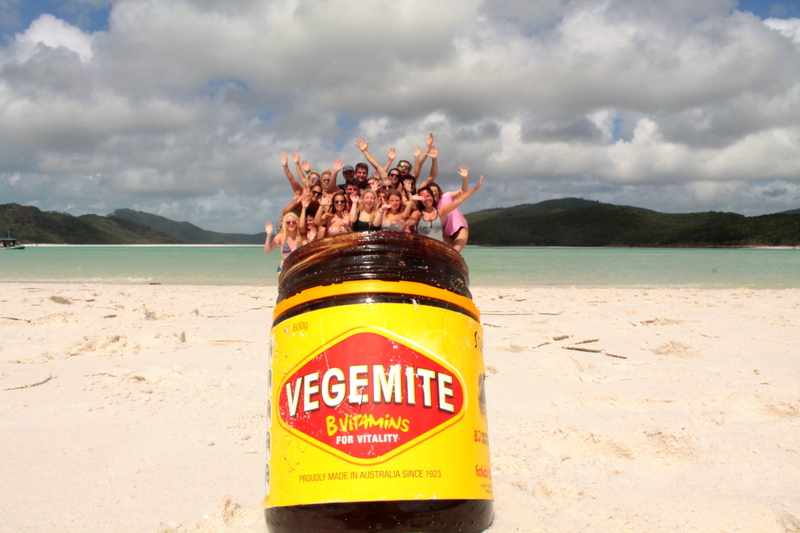 Have you ever been to the Whitsundays or the Great Barrier Reef? 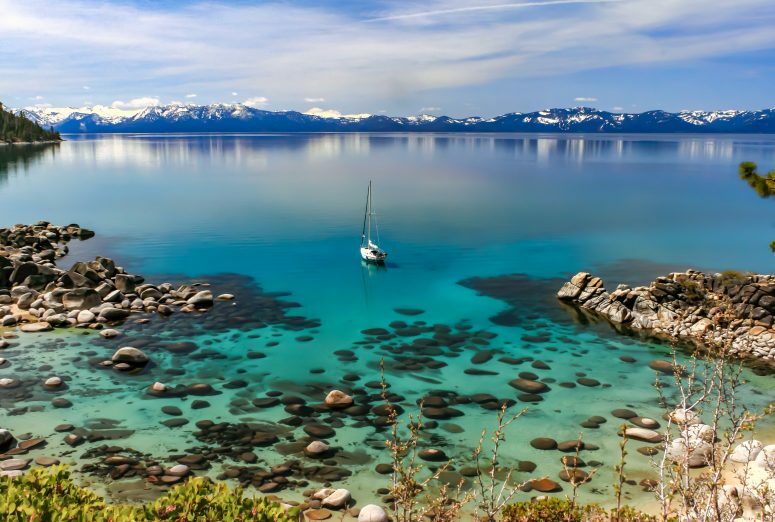 Have you ever lived on a boat for a couple of days? Put drift diving in Rangiroa on your to-do list. 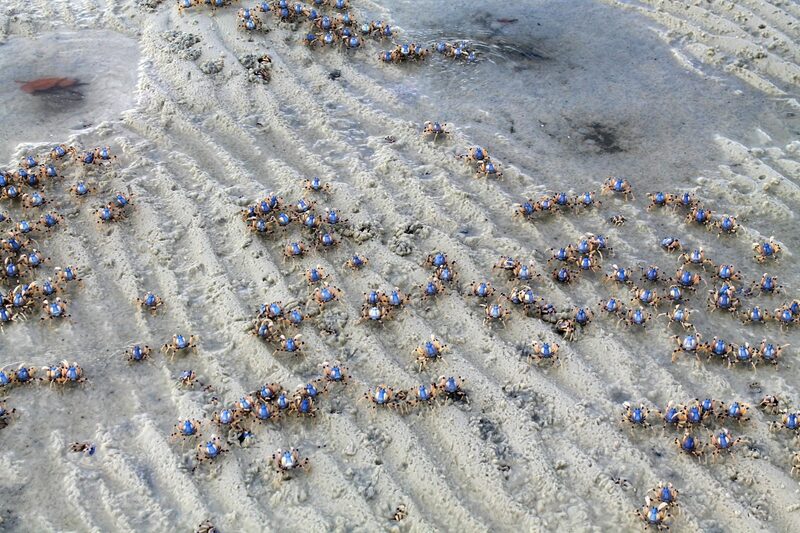 The water clarity and abundance of sea life will knock your socks off! I’ll definitely put it on my list! I’ve been wanting to go to French Polynesia ever since you and dad went to Tahiti.